West town has a eclectic, creative high energy and is on Chicago's northwest side. At the inter-sections of West Town, Ukrainian Village and East Village. You'll see vintage boutiques, recycled goods stores, galleries, museums, independent theater companies, small-scale music venues, boutiques selling lines from local designers, historic churches, brick cottages, swanky coffee shops and a popular restaurant and bar scene. West town day or night offers a so many things to do, all with a relaxed vibe and an easy walk away. If you are looking for a great place to eat, antique or reclaimed furniture or pieces, vintage accessories or if you want to check out traces of the area's humble immigrant history which includes my family history take a walk along the main arteries Division, Chicago and Grand Avenue. West Town is a neighborhood that's charm is created by it's diverse, yet united neighborhood. Homes consist of mostly single family old/restored and new, 2-4 units old and new. West Town is conveniently located west of the Chicago loop about a 10 minute ride. It's boundaries are Bloomingdale to Kinzie, and the Chicago River to Kedzie. 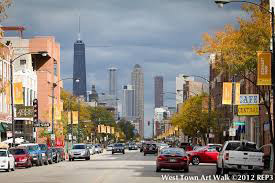 Neighborhoods/communities within Chicago West Town include: East Village, Eckhart Park, Humboldt Park, Kinzie Industrial Corridor, Noble Square, Smith Park, Ukrainian Village, and Wicker Park.